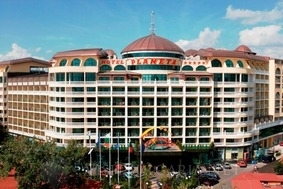 Planeta hotel in Sunny Beach, Black sea resort in Bulgaria. Online bookings. Location: Planeta Hotel and Aqua Park is the newest haven of luxury and tranquility in the very heart of one of the most attractive beach resorts in Bulgaria. Located 70m away from the beach, in the centre of Sunny Beach. Hotel Facilities: internet access, business centre, conference rooms, simultaneous interpretation facilities, children playground, shops and boutiques, hair and beauty salon, restaurant, disco/night club, lobby bar, pool bar, elevator. Room Facilities: air-conditioning, direct dial telephone, satellite/cable TV, radio, internet access, minibar, fridge, work desk, bath/WC, bathtub, balcony. The double rooms have a twin bed and a lounge area with folding sofa-bed and can sleep up to 2 adults and 2 children. The family rooms and the apartments consist of a bedroom and a separate lounge, each of them with a balcony. In all the studios a fully fitted kitchen is available. Sports & Recreation: fitness centre, outdoor swimming pool, steam bath, sauna, massage, jacuzzi, medical and spa centre.